Strategic & Tactical Planning - Innovative Growth Solutions, Inc.
IGS has extensive experience in developing strategic, tactical and operational business plans. Our flexible model can be tailored to meet the needs of any organization. Our planning process involves organizational leaders and other key stakeholders in an environmental scan to assess both internal and external forces that may impact the organization in the future. Once the stakeholders have developed a common understanding of the situation, stakeholders then define a future vision, which leads to development of specific initiatives to accomplish the desired vision. IGS is also experienced in developing tactical, operating and work plans that support implementation of the organization’s broad vision and strategic objectives. We involve staff and other stakeholders to bring the real world perspective into the planning process. This staff involvement builds buy-in and ownership that will lead to successful implementation. We also work with staff and organizational leaders to develop evaluation points that provide opportunities to check progress and adjust the plan as needed to meet the goals and objectives. 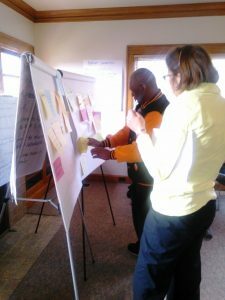 IGS has provided strategic planning services to many government and non-profit agencies including, City of Keizer, Clackamas County Historical Society, Portland Community College, Children’s Nursing Specialties and Aurora Colony Historical Society. IGS will meet with the organization’s Strategic Planning Steering Team to review past planning efforts, define the planning process and timeline and identify internal and external stakeholders that the organization would like to engage in the planning process. Following stakeholder interviews, IGS prepares a summary analysis for review with the Steering Team. IGS then presents the analysis to the leadership of the organization and facilitates a discussion to identify key strategic issues for the next five years. IGS will review results of the Phase One Assessment with the Steering Team to prepare for a planning retreat with the Board. IGS consultants will plan and facilitate the retreat to share results of the phase one assessment and to engage the Board in defining the future direction for the organization. Based on the Board’s guidance, IGS assists the Steering Team in preparing an implementation plan for the Board’s review and approval. IGS also documents the planning process and prepares a strategic plan report, including recommendations for periodic evaluation during the planning period. IGS then facilitates a meeting with the Board to review documents and recommendations and adopt the strategic plan.